Drawn and Quarterly, 9781897299357, 208pp. How do objects summon memories? What do real images feel like? For decades, these types of questions have permeated the pages of Lynda Barry's compositions, with words attracting pictures and conjuring places through a pen that first and foremost keeps on moving. What It Is demonstrates a tried-and-true creative method that is playful, powerful, and accessible to anyone with an inquisitive wish to write or to remember. Composed of completely new material, each page of Barry's first Drawn & Quarterly book is a full-color collage that is not only a gentle guide to this process but an invigorating example of exactly what it is: "The ordinary is extraordinary." 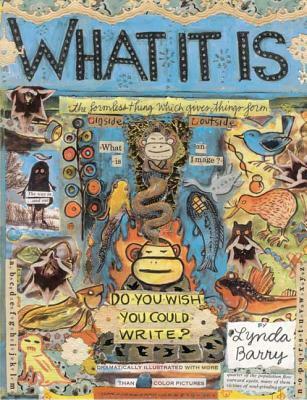 Lynda Barry has worked as a painter, cartoonist, writer, illustrator, playwright, editor, commentator, and teacher. She is the inimitable creator behind the seminal comic strip Ernie Pook's Comeek, and author of The Freddie Stories,One! Hundred! Demons!, The! Greatest! of! Marlys!, Cruddy: An Illustrated Novel, Naked Ladies! Naked Ladies! Naked Ladies!, and The Good Times are Killing Me, which was adapted as an off-Broadway play and won the Washington State Governor's Award. Barry has written three bestselling and acclaimed creative how-to graphic novels for D+Q: the Eisner Award-winning What It Is, and Picture This, and Syllabus: Notes from an accidental professor.